After all that planning, research, and agonizing, your wedding day is over. You’ve returned from the honeymoon and settled into your married life. In the next few weeks and months, you’ll be on a high from the love surrounding you. This doesn’t mean you should forget your dress. Depending on what you plan on doing with it after the wedding, you might have to address it immediately. While you’re deciding what to do with your wedding gown, you should get it professionally cleaned. It’s important that the dress is brought directly to a dry cleaner that specializes in bridal dresses since they require special care. You should never place it into a bag, add it to your closet, or stick it in the basement without having it dry cleaned. While some experts say that if your gown is 100 percent polyester, you can clean it yourself, we’d never recommend that. You could potentially ruin the gown, and waste thousands for a minimal amount of savings. Research dry cleaners long before you’re ready to have the dress cleaned. In fact, it makes sense to contact a few dry cleaners to find out the process and have your maid of honor or mom bring it to the shop while you’re on your honeymoon. You may be planning to keep your dress for your children or because of sentimental reasons, so you should be thinking about preservation before the wedding day. The first step to preserving the gown is to have it dry cleaned. Almost every next step after your wedding involves having the dress cleaned professionally. You’ll want to find a company that specializes in preservation. Unless you have a person who will wear the wedding dress within the next few months, it’ll be years before your children will be ready for the gown. In all that time, bugs and yellowing can occur. Check the reviews for the company, and how many years they’ve been in business. 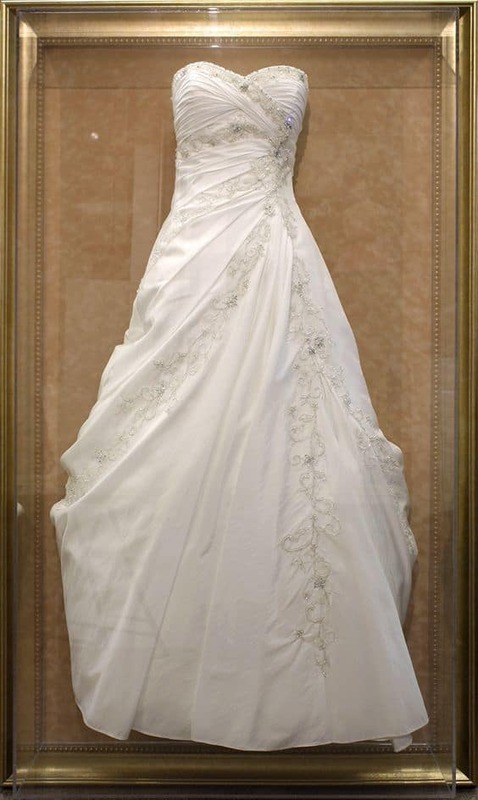 You want a company that has a long history of preserving wedding gowns. 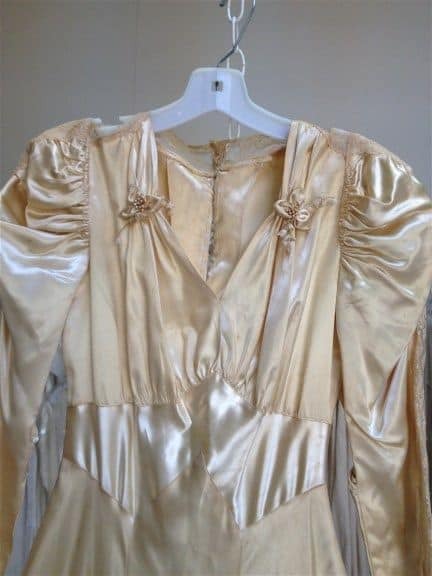 Some businesses will allow you to ship the dress to them, and they’ll ship it back to you in a box that will keep it free of yellowing. Once you find a company that has good reviews, ship the dress, and have it back in your possession, most companies recommend that you check the dress once a year for spots or yellowing. You want to make sure that any spots are treated immediately. If you decide to take part in a trash the dress session, you don’t need to have the dress cleaned since you’ll be in the water or mud anyway. You’ll want to hire a professional photographer to capture some compelling images of you and your groom trashing the wedding gown. It’s a unique and interesting way to use the dress again. For some brides, it makes sense to resell the gown. You might want the extra money or to provide a budget-conscious bride with a lovely gown for her wedding day. Like we’ve mentioned previously, get that dress cleaned by a professional shop first. Take some pictures of the gown hanging in a well-lit place. You can also include some pictures of you wearing the gown in your advertisement. The method and platform for selling the gown will depend on your preference. Your Facebook feed, a wedding gown group, eBay, or app like OfferUp are all good choices for your gown. Don’t expect to get full price for your gown. You’ve worn it, and used dresses are meant to be cheaper. Look online to see what the average used price is for your type of gown before listing the gown yourself. A charity can really use the money from your wedding dress. They’ll sell it in a thrift store where a less fortunate bride can get a cheap wedding gown. That money will be used for the charity. In other cases, they’ll sell the gown online and use the proceeds for the charity depending on what one you’ve chosen. You might also sell the gown yourself and donate the money to a charity that touches your heart. Some organizations take used dresses and use the material for other things. For example, some charities will turn the dresses into prom gowns. Other organizations will use the material to make burial attire for babies who have died in the hospital. It’s called Heavenly Angels in Need. Whether you decide to donate, sell, or save your dress, you should be thinking about what you’ll do long before your wedding day. Within a few days of the wedding, you’ll be on your honeymoon, but your dress will need to be cleaned or preserved immediately, especially for sale. Have your mom or new mother-in-law take the dress to the dry cleaner for you, and decide what you’ll do when you come back from vacation with your new husband.